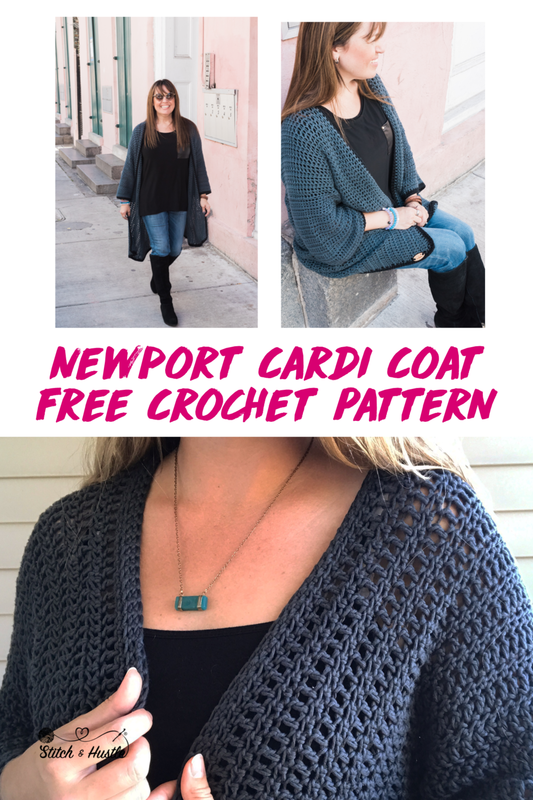 The Newport Kimono Sleeve Crochet Cardigan Pattern works up super fast and is great for beginners who want to dive into garments as well as experienced crocheters who want to create a cozy Cardi. I wore this all last summer as I traveled throughout the USA and it held up to every wear, wash, pack and wear again. Everyone lived it too and it was one of my most popular items. I designed to be made in a modular fashion making the assembly easy. I used Wool And The Gang Shiny Happy Cotton for the design and it holds the stitching and shape perfectly. This cardigan is perfect for cozy nights at home and transitional weather too. Trust me - you will just LOVE this cardi! This pattern is made in one complete piece for the body and two sleeves added after main piece is assembled. Row 1: Fhdc x 154 (154, 160, 160), turn. Row 2: Ch 2 (acts as dc), 153 (153, 159, 159) dc across, turn. Row 3: Ch 2 (acts as hdc), 153 (153, 160, 160) hdc across, turn. Rows 4 - 13 (17, 21, 25): Repeat Rows 2 & 3 alternating. Row 3: Ch 2 (acts as dc), 153 (153, 159, 159) dc across, turn. Row 4: Ch 2 (acts as hdc), 153 (153, 160, 160) hdc across, turn. Rows 5 - 13 (17, 21, 25): Repeat Rows 3 & 4 alternating. These remaining 23 (23, 26, 26) sts measure approx. 9.75 (9.75, 11, 11)” and this will be your arm hole. Beginning from the bottom, whip stitch join front & back seaming up the side until you reach the fastener. Rejoin yarn 2 sts before seam on back side. Round 1: Ch 1 (does NOT act as st), sc in same, sc in next 3 sts across to corner, 2x sc in each st at the turn to create the neck shape, 76 (76, 79, 79) sc all the way down the front panel; corner: 2sc, ch1, 2sc; 82 (82, 86, 86) sc across the bottom; corner: 2sc, ch1, 2sc; 76 (76, 79, 79) sc up the second front panel, 2x sc in each st at the turn to create the neck shape, sc in next 3 sts, sl st to first sc of Round to complete. Round 2: Ch 1 (does NOT act as st), sc in same, sc in next 3 sts across to corner, sc in each of 4 sts at corner; 78 (78, 81, 81) sc all the way down the front panel; corner: 2sc, ch1, 2sc; 86 (86, 90, 90) sc across the bottom; corner: 2sc, ch1, 2sc; 78 (78, 81, 81) sc up the second front panel; sc in each of 4 sts at corner, 2 sc, sl st to first sc of Round to complete.